From the heart and soul of visionary Nobel Peace Prize winner Nelson Mandela, a collection of his most uplifting, time-honored quotes that have inspired our world and offer a path for peace. 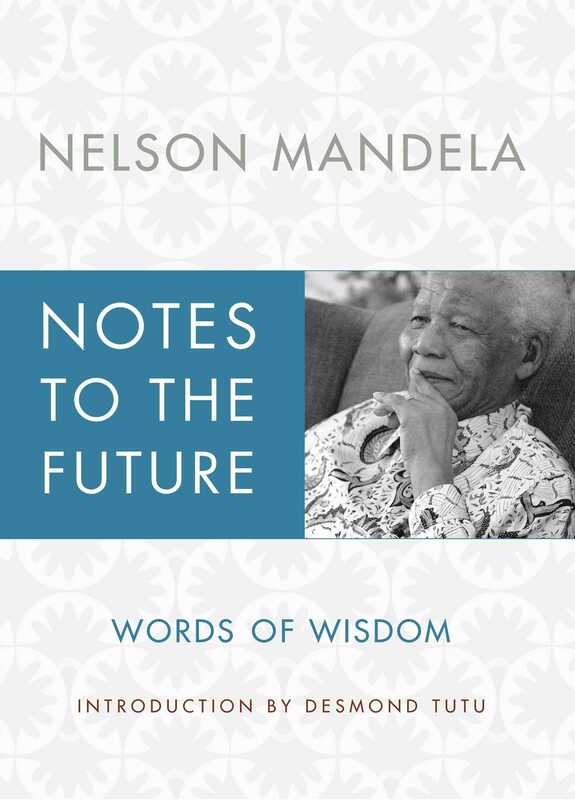 Notes to the Future is the definitive book of quotations from one of the great leaders of our time. This collection—gathered from privileged access to Mandela’s vast personal archive of private papers, speeches, correspondence, and audio recordings— features more than three hundred quotations spanning more than sixty years, and includes his Nobel Peace Prize acceptance speech. These inspirational quotations, organized into four sections—Struggle, Victory, Wisdom, and Future—are both universal and deeply personal. We see Mandela’s sense of humor, his loneliness and despair, his thoughts on fatherhood, and the reluctant leader who had no choice but to become the man history demanded. A good pen can also remind us of the happiest moments in our lives, bring noble ideas into our dens, our blood and our souls. It can turn tragedy into hope and victory. I would also like to take this opportunity to congratulate my compatriot and fellow laureate, State President F. W. de Klerk, on his receipt of this high honor. Together, we join two distinguished South Africans, the late Chief Albert Luthuli and His Grace Archbishop Desmond Tutu, to whose seminal contributions to the peaceful struggle against the evil system of apartheid you paid well-deserved tribute by awarding them the Nobel Peace Prize. It will not be presumptuous of us if we also add, among our predecessors, the name of another outstanding Nobel Peace Prize winner, the late Rev. Martin Luther King Jr. I am also here today as a representative of the millions of people across the globe, the anti-apartheid movement, the governments and organizations that joined with us, not to fight against South Africa as a country or any of its peoples, but to oppose an inhuman system and sue for a speedy end to the apartheid crime against humanity. These countless human beings, both inside and outside our country, had the nobility of spirit to stand in the path of tyranny and injustice, without seeking selfish gain. They recognized that an injury to one is an injury to all and therefore acted together in defense of justice and a common human decency. That triumph will finally bring to a close a history of five hundred years of African colonization that began with the establishment of the Portuguese empire. At the southern tip of the continent of Africa, a rich reward in the making, an invaluable gift is in the preparation for those who suffered in the name of all humanity when they sacrificed everything—for liberty, peace, human dignity and human fulfillment. In front of this distinguished audience, we commit the new South Africa to the relentless pursuit of the purposes defined in the World Declaration on the Survival, Protection and Development of Children. Thus shall we live, because we will have created a society which recognizes that all people are born equal, with each entitled in equal measure to life, liberty, prosperity, human rights and good governance. Such a society should never allow again that there should be prisoners of conscience nor that any person’s human rights should be violated. In relation to these matters, we appeal to those who govern Burma that they release our fellow Nobel Peace Prize laureate, Aung San Suu Kyi, and engage her and those she represents in serious dialogue, for the benefit of all the people of Burma. Far from the rough and tumble of the politics of our own country, I would like to take this opportunity to join the Norwegian Nobel Committee and pay tribute to my joint laureate. Mr. F. W. de Klerk. It remains our hope that these, too, will be blessed with sufficient reason to realize that history will not be denied and that the new society cannot be created by reproducing the repugnant past, however refined or enticingly repackaged. We live with the hope that as she battles to remake herself, South Africa will be like a microcosm of the new world that is striving to be born. The processes in which South Africa and Southern Africa as a whole are engaged, beckon and urge us all that we take this tide at the flood and make of this region a living example of what all people of conscience would like the world to be. A stirring collection of quotes from the Nobel Peace Prize winner. The quotes are inspirational and moving, regardless of any prior knowledge. The full script of Mandela's Nobel acceptance speech from 1993 rounds out this brief yet important look into the mind of a man determined to break apartheid regardless of the personal cost.